The childhood memoirs contained in Ordinary Lessons are intended to complicate the conventional portrait of white middle-class girlhood in the American 1950s. As they look back to their own remembered lives in families, schools, and communities, the authors undermine the popular image of unproblematic «happy days.» Their stories uncover the commonalties as well as differences in the cultural landscape they inhabited and explore the constraints and possibilities of the ordinary lessons girls learned in the 1950s. – Publisher description. 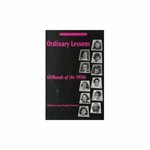 Franzosa, Susan D., "Ordinary Lessons: Girlhoods of the 1950s" (1999). GSEAP Faculty Book and Media Gallery. 1.